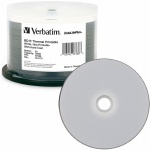 97338 Create high quality, customized labels for your BD-R discs with Verbatim White Thermal Printable Blu-Ray Recordable discs. 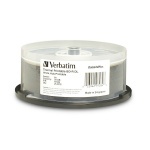 These discs have been extensively tested for compatibility with Everest thermal printers. MEDB-10000 When you need Blu-ray media and cost is a major factor, consider Microboards' line of BD-R media, available in three different printable surfaces in 50-disc spindles. Choose from the sleek silver lacquer thermal, the clean white inkjet, or the ever-popular white Everest thermal surfaces, all of which are hub-printable, allowing printing all the way to the center of the disc. MEDB-10002 When you need Blu-ray media and cost is a major factor, consider Microboards' line of BD-R media, available in three different printable surfaces in 50-disc spindles. Choose from the sleek silver lacquer thermal, the clean white inkjet, or the ever-popular white Everest thermal surfaces, all of which are hub-printable, allowing printing all the way to the center of the disc. 97284 Create high quality, customized labels for your Double Layer BD-R discs with Verbatim White Thermal Printable BD-R DL discs. 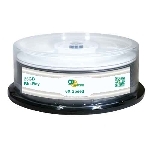 These discs have been extensively tested for compatibility with thermal disc printers from the top manufacturers. With a storage capacity of 50GB, these are one-time record discs, ensuring that your video, music or other information will not be erased.